I'm having my annual mammogram today, as my HMO still believes there's value in this preventative diagnostic test. I choose to have them in October, breast cancer awareness month, because it reminds me how lucky I am not only that I've never had cancer, but also that I have access to state of the art medical care. Lucky, lucky Janiece. 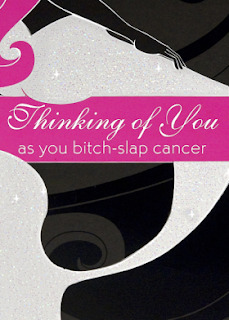 So in honor of me being a lucky, lucky Janiece, I'm going to buy some of these Foxy Blunt cancer support cards, because they make me laugh, and they suit my personality, and a portion of the proceeds will go to the Young Survival Coalition. While I don't currently have anyone in my life who's battling cancer, it's a sad fact of life that eventually, I'll need to send these to someone. I love it! A friend of ours was just diagnosed with Brest Cancer and had to leave her job. She would appreciate a card like that. Here's hoping it the x-rays come out clean.